Note: Hydroelectricity includes pumped storage. Vietnam is poised to significantly transform its electrical power generation mix over the next two decades as it modernizes the country's agrarian economy to become a more industrialized nation. 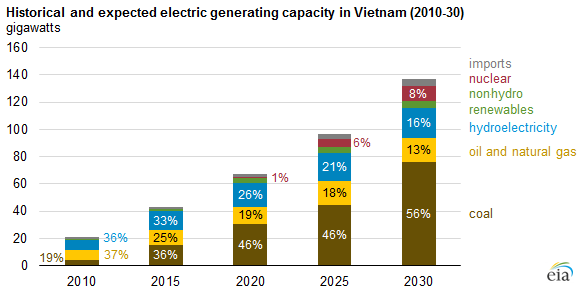 To accommodate greater industrial expansion and to support energy security goals, Vietnam is significantly increasing its total electricity generating capacity. As part of its capacity expansion, Vietnam plans to add substantial coal-fired capacity and also plans to build the first nuclear reactors in Southeast Asia and the first offshore wind farm in Asia. Recently, Vietnam's rapid economic growth, industrialization, and export market expansion have been accompanied by increased domestic energy consumption. Vietnam's General Statistics Office estimates that electricity demand will continue to grow at recent annual growth rates of 10%-12%, rising from 169.8 terawatthours (TWh) in 2015 to 615.2 TWh by 2030. In its 2013 Country Nuclear Power Profile, submitted to the International Atomic Energy Agency (IAEA), Vietnam forecast a 2015 generation capacity of a little more than 40 gigawatts (GW), increasing to nearly 140 GW to meet projected demand in 2030. Coal. In 2014, annual coal consumption was 19.1 million tons, a 21% increase over 2013. Coal consumption has continued to increase in 2015 as unseasonably hot weather contributed to a decline in hydropower generation. Vietnam is still in the process of developing its coal-mining sector and must import relatively higher-priced coal. State-owned PetroVietnam (PV) is seeking to purchase 11 million tons of coal per year starting in 2017 to supply Vietnam's domestic power industry. Natural gas. Increased foreign investment during the past decade resulted in greater natural gas exploration, significantly increasing Vietnam's proved natural gas reserves. The country currently produces as much natural gas as the nation consumes, but PV expects a potential supply gap with consumption outpacing supply. PV Gas, a subsidiary of PV, expects the Thi Vai and Son My liquefied natural gas (LNG) terminals to be operational in 2017 and 2018, respectively. In 2014, PV Gas signed a sales and purchase agreement with Russia's Gazprom. Under the agreement, PV Gas will receive 48 billion cubic feet of natural gas per year through the Thi Vai LNG terminal. Nuclear. The first nuclear reactors for power generation in Southeast Asia are planned to be built in Vietnam. In 2010, Russia agreed to build two 1,000-megawatt (MW) reactors at Nin Thuan 1. Japan followed in 2011 with an agreement to build Nin Thuan 2. Japan's 2011 Fukushima nuclear accident delayed construction plans for both projects. Construction for the Nin Thuan 1 project is not expected to start until 2020. Wind. Vietnam is building the first offshore wind farm in Asia. Phase I (16 MW) of the Bac Lieu wind farm is operational, and Phase II (83.2 MW) is expected to be complete in 2016. In March 2015, the United States Trade and Development Agency awarded a feasibility study grant for a potential Phase III. Another project, the Tay Nguyen wind farm, broke ground in March 2015. The facility has a design capacity of 120 MW; the first phase (28 MW) is expected to begin operating in 2016. The installation of this new generating capacity will require new transmission and distribution (T&D) infrastructure. Electricity Vietnam (EVN), the state-owned utility, is pursuing the dual challenge of modernizing this infrastructure while also installing greater electric generating capacity. Securing international investment in planned generating capacity and infrastructure is also critical. The World Bank Transmission Efficiency Project committed $500 million toward increasing T&D capacity and reliability in Vietnam. For more analysis, see EIA's Country Analysis Brief on Vietnam.